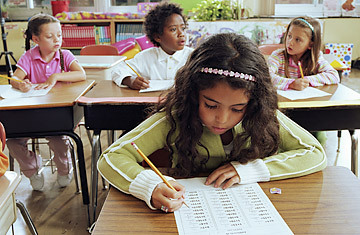 Education Reform: Obama's Bipartisan Issue? Does Obama's Education Plan Make the Grade? Like many families, we try to escape the summer heat by going north. This year we spent a week in New Brunswick, Canada, at Shediac Beach, the self-proclaimed lobster capital of the world. But wait  Rockport, Maine, also calls itself the lobster capital of the world and has harvest data to back it up. Meanwhile, Nova Scotia claims the largest lobster ever caught, a 44-lb. (20 kg) monster capable of devouring a house pet. So what determines lobster capitaldom? Harvesting? Big ones? A festival like the one in Shediac? Who decides, anyway? Unfortunately, similar definitional confusion plagues an industry far more central to American life: our public education system. Today states, school districts, and in some cases individual schools are allowed to set both their academic standards and the tests to determine whether students are reaching them. In other words, lots of different entities get to decide whether to call themselves "education capitals." Not surprisingly, many claim to be high performers. And because there are so much conflicting data, it's often hard even for those in the education field to make heads or tails of it. This localized approach to education policy results in highly variable quality around the country as well as a systemic shortchanging of low-income and minority students. Over the past two decades, the federal government has taken steps, with modest and mixed results, to address achievement gaps. But the variance problem persists. For example, 47% of Massachusetts' fourth-graders are proficient in reading on the National Assessment of Educational Progress (a test regularly given to a sample of students, with no stakes attached) while just 33% of Wisconsin's fourth-graders are. But based on its own state tests, Wisconsin proclaims that 81% of its kids are proficient in reading. All Secretary of Education Arne Duncan can do is complain that states are "lying to children and parents." There's a state-led effort to change this. During the past year, organizations representing the nation's governors, chief state education officers and standards experts came together to develop a new set of academic standards in English and math. A recent analysis by the Fordham Foundation found that the proposed math standards were as good as or better than the standards currently used in every state. Fordham found the English standards to be as good as or better than all but those in California, Indiana, and D.C.